Simply wet the stick, rub it on the stain and then launder as usual. 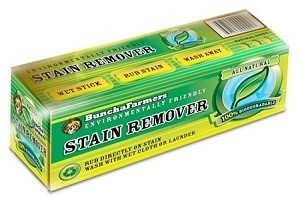 This potent and highly effective stain remover is made with all-natural, biodegradable ingredients, and enhanced with borax to soften the water and aid the cleaning process. No artificial dyes or perfumes, just the fresh, clean scent of natural Eucalyptus* and the deodorizing power of Litsea. Best of all, it works wonders on blood stains (plus grass, grease, red wine, ink, ring around the collar, and more). Color safe and hypoallergenic. Note: This product may not be appropriate for those sensitive to strong scents. Please do not ingest or use around food, keep out of reach of children and pets, and make sure you rinse or wash clothing and surfaces thoroughly after use.